TWO is a collaborative project for Motion Bank by Maria Palazzi (ACCAD/Design) and Norah Zuniga-Shaw (ACCAD/Dance) at The Ohio State University. TWO examines choreographic thinking in the construction of performance improvisation for small groups. Our work begins and ends with two choreographers, unrelated to each other. Bebe Miller (North America) and Thomas Hauert (Europe). In this project, we have selected two working strategies each from the two choreographers that together bring us into a direct encounter with the dancing mind and the thinking body. Both Thomas Hauert and Bebe Miller are currently choreographing improvisation for performance and are engaging directly with the nature of human consciousness. When we watch them and their dancers, we are watching them at work. We are witness to the concentration and forms of attention that they bring to the moment and to how they work with their habits, tendencies, impulses, and memories in action. The results were launched publicly as part of a suite of score projects for the Motion Bank initiative of The Forsythe Company on November 28, 2013. Research Team: Matthew Lewis, Vita Berezina-Blackburn, Malory Spicer, J. Eisenmann, and Michael Andereck of the Advanced Computing Center for the Arts and Design (ACCAD), The Ohio State University. Participating artists from the Bebe Miller Company: Bebe Miller, Angie Hauser, Darrell Jones, Talvin Wilkes (dramaturge). Participating artists from the Zoo Company: Thomas Hauert, Sara Ludi, Samantha van Wissen, Mat Voorter. The phrase “the dancing mind and the thinking body” is borrowed with permission from the writing of scholar David Gere in a volume on dance improvisation that he co-edited with Ann Cooper-Albright entitled “Taken by Surprise” (Wesleyan University Press, 2003). Gere’s excellent introduction to the text is one of the best overviews that we have found of the rich mind and body experience that is dance improvisation. At ACCAD we teach through research and research through teaching. 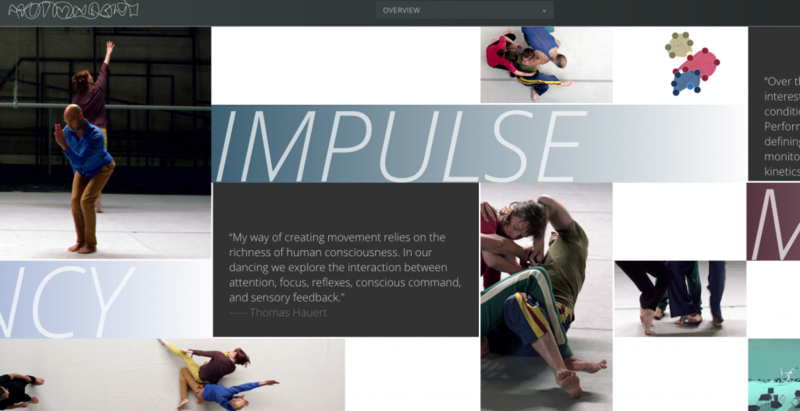 With this particular project we are grateful to the experimentation and discourse generated by students in the Expressive Motion and Interdisciplinary Workshop courses as profiled on the blog. We are also grateful to ACCAD students Sheri Larrimer, Chia-Lei Chen, and Thomas Heban for their technical contributions at several key junctures. Our video resources were shot with the expert cinematographic contributions of Lillian Skove and TJ Hellmuth and the expert help of their local Columbus crew as well as ACCAD staff Oded Huberman and Elaine Smith, and numerous student volunteers including Allison Biesboer, Chia-Lei Chen, Tom Heban, Sheri Larrimer, Sofie Ann Clemensen, Katie Aylward, Malory Spicer, J. Eisenmann, and many others. The video was shot at the Thurber Theater, Department of Theater, the Ohio State University. PACT Zollverein Choreographic Center in Essen, Germany provided a valuable research residency for Norah Zuniga-Shaw in December of 2011, which was central to the collaboration with Thomas Hauert. Motion Bank, is a project of The Forsythe Company providing a broad context for research into choreographic practice. The main focus is on the creation of on-line digital scores in collaboration with guest choreographers to be made publicly available via the Motion Bank website.